If you’ve ever been told your big idea is “too ambitious” or “too audacious,” I know how you feel. I was told the same thing when I wanted to create a community development organization where Kenyans would lead other Kenyans out of extreme poverty. I didn’t give up and neither should you. The story of Nuru Kenya, a locally led organization transforming Southwest Kenya by helping to lift thousands of people out of extreme poverty, will inspire you to achieve the impossible. I moved to Kenya in September of 2008 to launch Nuru. My first week in Kuria West was really tough. I was attacked by thieves and black widow spiders, contracted a severe case of malaria, and was struck by lightning. This was my first week! I felt powerless and defeated. I had never quit anything, but I was ready to throw in the towel and head back to the U.S. I left his home changed, with a dramatically different perspective and understanding of our work, of Philip, and of the farmers I was to live alongside and work with. 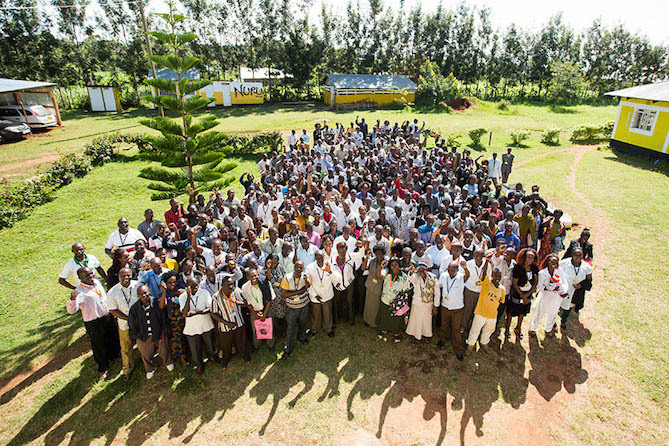 Since 2009, more than 300 Kenyans and 40 expats have partnered with more than 78,000 people in Kuria West to transform their communities with lasting meaningful choices. At a quiet ceremony in this past June, I officially handed the reins of Nuru Kenya over to Philip’s successor, Pauline Wambeti, and her team. I know that she and her team are ready, and I know that Nuru Kenya has now become what Philip and I had always intended it to be: Kenyans leading Kenyans out of extreme poverty. Read more about Nuru International on ONE.org and at NuruInternational.org, then join us in the fight against extreme poverty!